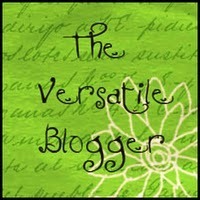 I received the Versatile Blogger award from both Ann Elise Monte and S.M. Boyce. By the way if you do not know their blogs, go pay them a visit, I promise it’s worth it 🙂 Thank you again very much ladies, I really appreciate it!!! Robin – She has a great mix of things including the feature “news to novels” which triggers my creativity buttons and if you have not read her RTW take on two characters from different YA novels meeting up, you should it´s hilarious! Colin – Colin has been one of the first blog I started to follow and I love that he mixes things up while keeping it real. Tracey – She not only has great graphics (no really look at them! ), she also has great ideas! For example: creepy children prompt and the YA book club. Thank you very much! 🙂 That really means a lot.